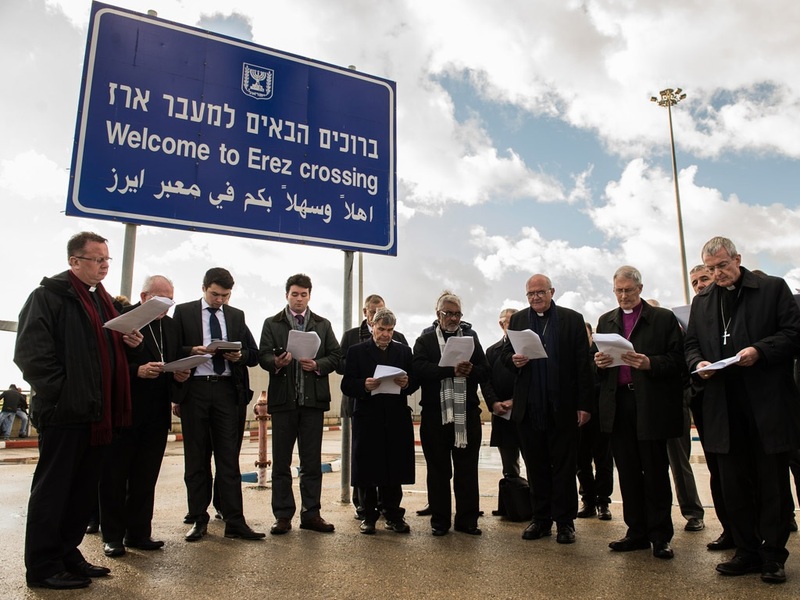 Bishop John McAreavey today begins a ten-day visit to the vulnerable Christian communities of Gaza, Bethlehem and refugees in Jordan with a group of bishops from across Europe, North America and South Africa. The bishops are members of the Holy Land Coordination group and on Thursday the delegation will visit the small Christian community in Gaza, celebrating Mass at the parish of the Holy Family, meeting with parishioners, visiting the school of the Holy Rosary Sisters and various projects helping people to rebuild their lives following the most recent conflict in 2014. The bishops are returning for the third consecutive year during which time the conflict of 2014 has led to the deaths of over two thousand Gazans, including over 500 children with one third of the population being internally displaced. The Christian community comprises 2,500 people, of whom Catholics number around two hundred. They will then return to Bethlehem where they will celebrate Mass and visit the Christian community of Beit Jala which has suffered the loss of land and livelihood following the annexation of their property as well as the building of a Separation Wall in the Cremisan Valley. The focus of the remainder of the visit will be Jordan and the refugees who have been forced out of their homes as a result of the ongoing conflict in Syria and Iraq. The United Nations puts the total number of refugees currently in Jordan at just over one million people, the vast majority of whom are Syrian. The delegation will arrive in Jordan on 10 January and leave on 14 January. The Holy Land Coordination was set up at the invitation of the Holy See at the end of the last century to offer support to the local Christian communities of the Holy Land. For the past fifteen years the Bishops’ Conference of England & Wales has organised the visit. This year will be led by Bishop Declan Lang of Clifton. The Holy Land Coordination’s raison d’être has been expressed as ‘the 3 Ps’: Prayer, Pilgrimage and Pressure. The Coordination is not seen by the Holy See or its members as a fund-raising or project-based body, although considerable development investment and growth in pilgrimages have developed directly as a result of the bishops’ visits. Prayer is the framework of the annual meeting, with daily celebration of the Eucharist, often in different rites, and in some years it has involved celebration in common of the Liturgy of the Hours. Pilgrimage is one of the most interesting and informative aspects of the annual meeting. Bishops go either individually or in groups to visit Catholic communities and share in their Sunday liturgy, meeting members of the local community and sometimes local political figures. In difficult times, the visiting bishops have often heard pleas for more pilgrims to come from their home countries, and there has been a concerted and successful effort on the part of bishops’ conferences to encourage pilgrimages. Pressure, a softer version of which might be ‘Persuasion’, refers to the work to be done after the annual meeting, when bishops go home and speak to their own governments, parliamentarians, Israeli and Palestinian ambassadors and to the media about a wide range of issues affecting the lives of Christians. In line with the approach the Holy See adopts everywhere else, the bishops do not seek privileges for Christians, but dignity and justice for them and for others in similar conflicts. Perhaps there could be a fourth P: Presence. The bishops are present every year, and by their presence they hope, above all else, to remind the “living stones” of the Christian communities in the Holy Land that they are not forgotten by their brothers and sisters in other parts of the world. This year’s meeting will focus on the situation of vulnerable Christians especially those who have been forced to flee their homeland and seek shelter elsewhere. The Coordination will also continue to focus on the situation in Gaza and issues around the Cremisan Valley. The Coordination will also visit the Local Church in Jordan.